For other people of that name, see Tom Scott (disambiguation). 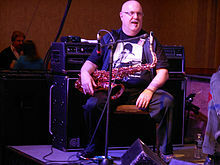 Thomas Wright Scott (born May 19, 1948) is an American saxophonist, composer, and arranger. He was a member of The Blues Brothers and led the jazz fusion group L.A. Express. Scott was born in Los Angeles, California. He is the son of film and television composer Nathan Scott, who had more than 850 television credits and more than 100 film credits as a composer, orchestrator, and conductor, including the theme songs for Dragnet and Lassie. His professional career began as a teenager as leader of the jazz ensemble Neoteric Trio. After that, he worked as a session musician. He wrote the theme songs for the television shows Starsky and Hutch and The Streets of San Francisco. He played the soprano saxophone solo on the No. 1 hit single "Listen to What the Man Said" by the band Wings. In 1976 he played the theme "I Still Can't Sleep" in Taxi Driver. In 1982, he collaborated with Johnny Mathis on "Without Us", the theme to the 1980s sitcom Family Ties. He also played the lyricon, an electronic wind instrument on Michael Jackson's Billie Jean. Scott was a founding member of the Blues Brothers Band, despite his absence in the two films, The Blues Brothers and Blues Brothers 2000. According to Bob Woodward's account in Wired, a biography of John Belushi, Scott left the band after their 1980 tour over a salary dispute. However, he reunited with Dan Aykroyd and the Blues Brothers Band in 1988 to record a few tracks for The Great Outdoors. Scott led the house band on two short-lived late night talk shows: The Pat Sajak Show and The Chevy Chase Show. He was music director for the 68th Academy Awards in 1996, several Emmy Awards telecasts from 1996 to 2007, Ebony's 50th Birthday Celebration, and the People's Choice Awards telecasts. He produced two albums for tenor vocalist Daniel Rodriguez. The Spirit of America has sold over 400,000 copies to date. Scott is also a member of the Les Deux Love Orchestra and has conducted over thirty symphony orchestras around the U.S. as music director for Rodriguez. ^ Burlingame, Jon (March 3, 2010). "Nathan Scott, 94, scored TV shows". Variety. Retrieved September 20, 2018. ^ Woodward, Bob (1987). Wired. Simon & Schuster. This page was last edited on 13 April 2019, at 03:01 (UTC).